Dennis has been an Investment Advisor Representative since 1998. 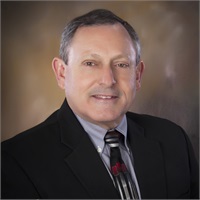 He has lived and worked in the Great Bend community since receiving his Bachelor of Science degree in pharmacy from the University of Kansas in 1975. His interest in helping others achieve their financial goals prompted him to make a career change, one that has been helpful and rewarding for his clients. Growing up in the “oil patch” and working in the medical field gives him a down-to-earth perspective for clients employing his services. Researching investments and matching them to a client’s needs and risk level is imperative to pursuing one’s goals and dreams. Guiding clients down this path to financial well-being is his passion, and open communication with his clients is the key. Dennis and his wife Jann have raised two college graduates, Jill and Todd, who now have careers of their own. Family has been and will continue to be a primary focus for him. He is actively involved with his church by serving on leadership committees, leading an adult Sunday school class and participating in community outreach. He is a director for a 501(c)(3) organization which provides support for missionaries. As a licensed pharmacist, he occasionally provides relief work for local hospital pharmacists. Spending time with family and friends, enjoying an occasional round of golf, practicing amateur photography, and following Barton College sports and KU basketball provide enjoyment away from the office.